When the margin between success and total failure is such a close equation, a shower, a few days difference in planting time, a high wind at a crucial time, when so much hangs in the balance and that balance is mostly weather it is very difficult to make a responsible generalisation that accurately describes conditions as they really are. 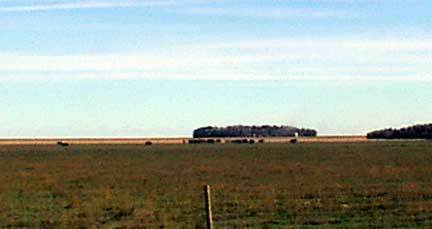 With this in mind I drove East of Tisdale about five or six miles then went North about the same distance. I was hoping that what I saw would give me a sample of what conditions exist in this very small area of the grain belt. Mr. Armstrong's bison were holding a small gathering in the centre of the pasture kicking up a bit of dust. Since these characters often express their disagreements in a rather physical manner it was unfortunate for us that they were not holding their meeting closer to a fence. But the pasture looks very good. It appears that he has sufficient pasture for the size of the herd and the alfalfa growth on the field has been abundant enough to satisfy their needs. 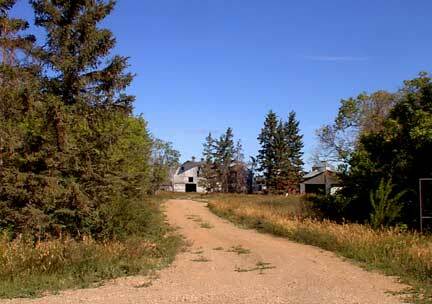 Half a mile North of the Armstrong pasture I stopped and admired the lane on the North side of a farm yard. 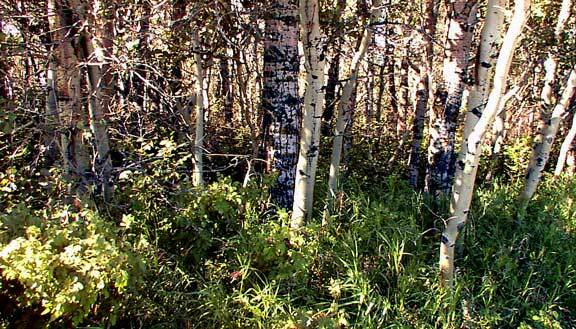 The heavily treed area betrays the general dry conditions but than that is the nature of forest it is in itself a means of conserving moisture. This land was all forest much less than a century ago. 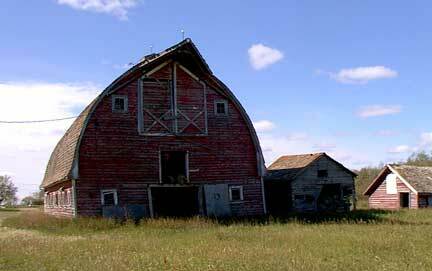 This part of Saskatchewan has seen the rapid development of corporate farms. Farms that involve massive land holdings farmed in an efficient and the most cost effective method possible. In one farm yard we see four combines parked side by side and a fifth a couple hundred yards away. 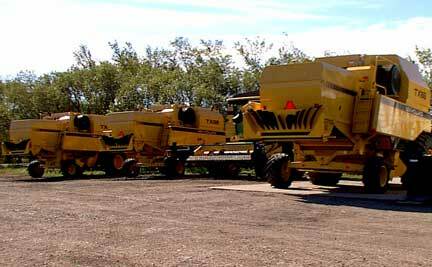 This collection of machinery pretty much tells the story of the crop year of 2002. With interest and principle these machines should have annual payments of about $180,000 or about the value of six brand new pickup trucks or cars. A farm that would use this much machinery this equipment would represent about one quarter of its capital equipment and that means annual payments of just under three quarters of a million dollars. There simply isn't three quarters of a million dollars in crop in these fields. That means the crop year of 2002 without paying for fertilizer, fuel and taxes is definitely a year of losses. Fortunately, this area even last year was able to produce break even crops so a set back like this may be absorbable but keep this in mind when you realise that the government of the United States is subsidising its farmers even while they are producing a crop, these folks here will see little money from their governments and they are far below the break even point with little or no crop to sell. In terms of the span of time the economics of agriculture in Canada has always been in crisis. 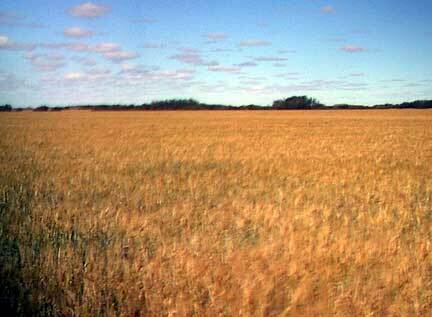 Originally Saskatchewan was settled at the level of one family farm per quarter section of land and this explains why Saskatchewan at one time had a population in access of two million people. Now we have just over a million folks with only a small fraction of that population living outside of the cities. 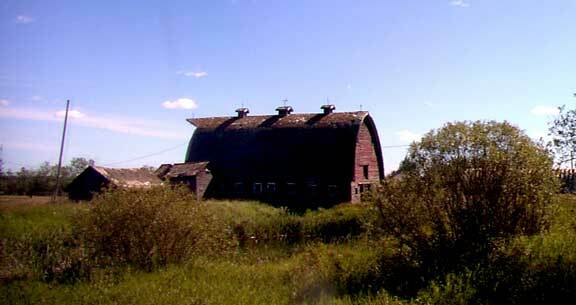 When this barn was built it would have represented a major capital outlay and only a prosperous farmer would have had the money to construct such a building with its hay loft. Now, about three generations later this farm is part of a large operations the original owners long gone with only this remnant of the once prosperous operation left behind. As I drove North I discovered more than half of the fields were cleaned up for the year. They have been harvested, cut for feed or like the one at the top of the page plowed under. Most cereal crops will be harvested in the next two weeks and all are ready. 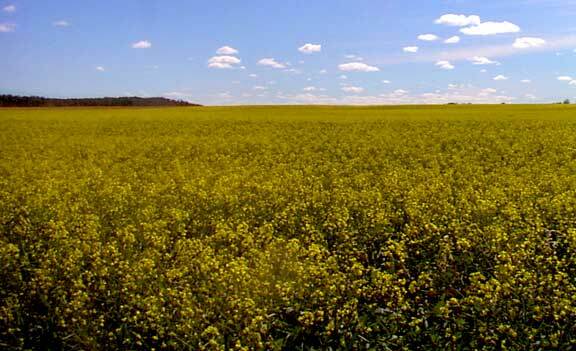 Oddly enough Canola is in bloom in substantial numbers of fields. In a normal year the Canola flowers in mid June or early July but this year there were crops that were not put in the ground until very late. 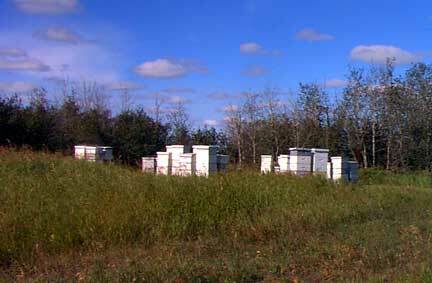 These bees have had a hard time this summer. The savage cold of June was really tough with few flowers to provide them with sustenance then the extreme heat without moisture made life for them even more miserable, now we are back into a cold snap. Fortunately they have two nearby fields of Canola to look after so they are busy right now. Little barley has been planted this year and like this crop most are very light with very short straw. Nevertheless this is a harvestable crop and depending on quality it should pay for itself since feed grain prices are expected to remain reasonable. Going West I came across several Wheat crops that were astonishing. I have seen crops like this in the Southern part of the province during 1988 but this is the always rich Tisdale area and the wheat crop seen below is about ankle high and walking through it would not trample the plants as they are so sparse that most of the ground is actually bare of plant life. It would be doubtful if a combine even goes near this field. The harvest of 2002 is not something anyone really looks forward to as it really just represents addition cash outlay with little prospect for return. The fields have to be processed, made ready for winter and next year's growing season, that involves spraying, mulching the wasted fields and harvesting what little production is out there. Blackening the fields while going into the red.